On the banks of the Nile was located the third of the three great seats of primeval civilization. Egypt holds with Phoenicia and Babylonia the honor of radiating all the ancient civilization over the world. The philosophers and statesmen of Greece all sought in Egypt the source of most of their own institutions; and Roman Emperors resorted to Egypt for wisdom. Even in the days of Moses, Egypt was noted for its learning; and the Hebrew lawgiver did not hesitate to adopt several of its laws and institutions for his own countrymen. Solon studied deeply those laws and institutions before he promulgated his own code for Athens. Under the influence of successive conquests and devastations, the Pharaonic civilization perished, as did that of Phoenicia and Babylonia. Memphis, Thebes, On and Tanis, the great cities of Egypt, fell, as did Tyre and Sidon and Babylon and Nineveh; and with them departed the glory of their great accomplishments, their arts and sciences, their language and their religion, their philosophy and their law. But the Egypt of the Pharoahs has left the most remarkable monuments of the world in its wonderful ruins. As we have already stated, it is only within the last seventy years that from beneath the sands of the desert and the accumulation of twenty-four centuries of ruin some remnants have been uncovered of the great civilization of Asshur and Babylon. Many of the monuments of Egyptian greatness have always remained standing and stately and visible to the eye of the traveler, although in ruins. The Pyramids and the Sphinx still rear their gigantic dimensions on the western bank of the Nile, as they did when Alexander of Macedon, and Cambyses the Persian, and Nebuchadnezzar of Babylon, and Asshur-bani-pal of Asshur passed by in their lurid career of conquest; and the temple shrines of Ipsambul and Karnak, testifying to the glory of ancient Thebes of the Hundred Gates, yet show the magnificent granite columns erected ages ago, before Rome was, before Homer sung, before Athens had a name. And supposed to have been successfully concealed from the foreign spoliator, the tombs of the Pharaohs in the Libyan Hills that were fondly hoped to have been sealed till the judgment day, have given forth their dead, and have given us a vast insight into the life and history of ancient Egypt. Here everywhere have been found inscriptions in the language of the Pharaohs, which, long a puzzle, have during the course of the century just past been deciphered. From beneath the dust of ages papyri have been unearthed which tell us something of the lore of the ancient priesthood; and, although we are not yet able, and probably never will be able, to reconstruct the lost history of Egypt, We have learned enough to get some idea of the manners and customs, laws and institutions, which, even in their decay, elicited the admiration of Plato, Herodotus, and Diodorus Siculus. It is a singular thing, that, although we have greatly more copious monumental records of the ancient Egyptian civilization than we have of the civilization of Asshur and Babylon, yet the remnants which we have of Asshur and Babylon give us a far greater insight into their laws than the Egyptian records give us of the legislation of the Pharaohs. In Explanation of this it has been assumed by some that the civilization of Egypt was of a more primitive type than that of Asshur and Babylonia, and that the Egyptians were never a sea-faring people, and were always less enterprising than the cognate Hamite races of Babylonia. But this assumption is not supported by the known facts of history. The "wisdom of the Egyptians," in which we are told that Moses was instructed (Acts of the Apostles, ch. vii:22), the fact that Egypt from its location on the Nile and the Red Sea and along the shores of the Mediterranean must necessarily have been a great sea-power, and upon the authority of Diodorus Siculus, at one time held the Empire of the Mediterranean (B.C. 787-734) and may have held it many times before, and finally the eminence reached by the Egyptians in the arts and sciences, and especially in philosophy, would indicate that they were equally proficient in legislation. Moreover, among their monarchs five are specifically mentioned by Diodorus as great legislators - Mnevis (the name which he gives the founder Menes), Sasychis, Sesoosis (the Sesostris of Herodotus), Boccharis, and Amasis - two of whom, Boccharis and Amasis, lived in the later days of the monarchy, and one of whom, at least, Boccharis the wise, as he was called, gained renown for the wisdom of the laws which he enacted. Whatever may have been the cause, there are but few traces left of the legal system of ancient Egypt. The political organization of the country recognized a division into Upper, and Lower Egypt - in later times, into Upper, Middle, and Lower Egypt - and a subdivision of the whole country into thirty provinces designated as nomes. The Middle District is known to have comprised seven of these nomes, and therefore in the Greek times received the Greek name of Heptanomis or the Seven Nomes. In each nome and in the principal cities of the several nomes there were local judges; and there was also a great central court, composed of thirty judges, ten from each one of the three districts, or from their three principal cities, Thebes, Memphis, and On or Heliopolis (the City of the Sun). One of their number, we are told, was chosen or appointed president of the tribunal, and thereupon another was chosen from his city or district to fill the place left vacant by him, so that the number of judges, exclusive of the President or Chief Justice should always be kept at thirty. This would seem to indicate something like a selection of judges by some kind of electorate rather than by the monarch. All the judges both of the central and the local courts appear to have been selected from the sacerdotal caste, which engrossed to itself not only the ministry of religion, but likewise the practice of medicine and the administration of the law. The king, of course, as in all ancient nations, occasionally administered justice in person, but, as the historians have remarked, the king of Egypt, although springing not from the sacerdotal but from the warrior caste, was always at his accession initiated into the mysteries of the priesthood, and thereby became affiliated with the priestly class, the possessors of all the knowledge of the time. The system of caste or class, to which we have referred, was not wanting in any ancient, or many modern nations of the world. It is not extinct today in the presence of the dominant democratic sentiment of the Twentieth Century; but it reached its greatest development in ancient Egypt and modern Hindustan. In both of these countries the priesthood and the warrior class divided all power between them, the priesthood, of course, by the power of intellect, being generally predominant. It would seem that in Egypt these two orders constituted something like a feudal class which owned most of the land and leased it out f or cultivation to the class of agriculturists. From the monumental records of Egypt and from the sparse notices of the historians we learn enough to show us that in the Egyptian courts there were written pleadings, not substantially different from our own at this day; that there was examination of witnesses for each side; that there were no speeches by advocates for either party - forensic eloquence seems not to have been cultivated in the Land of the Nile; that the courts decided by a vote of the majority of its members; and that no costs were ever charged against either party, in order that justice might always be free to all, a principle which, although perhaps not practicable in our modern conditions, certainly has theoretically many considerations in its favor. With reference to the domestic relations, it is a peculiar fact that in Egypt the matrimonial union seems to have been placed on a greatly higher plane than in most of the other ancient nations, not even excepting that of Israel. While it is true that both polygamy and divorce were allowed, yet both were of rare occurrence, and may be regarded as almost exceptional. The husband and wife were equal in the household. According to the historian Diodorus Siculus, the wife seems to have been more frequently from the mother than from the father to the son; and it was not unusual for a father to transfer his property to the mother, so that the son might inherit from her. Wills and testaments would seem to have been practically unknown in Egypt before the days of the Ptolemies, when, with other Greek usages, they were introduced into the civil polity of the country. 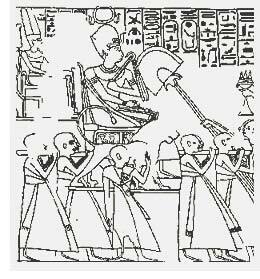 During the Ptolemaic period there are several instances related by the historians of the sovereignty itself being transmitted by will. Ptolemy Auletes, the father of Cleopatra, assumed by will to settle the monarchy and its dependencies among his four children. As might naturally have been expected, there was considerable similarity in some respects between the institutions and the laws of Egypt and the corresponding provisions of the Mosaic Code. Both systems had the week of seven days, and the same punishment for perjury and false testimony. Both codes were equally mild in their criminal branches, as compared with the more severe penalties imposed by various other nations; and in both there were provisions for the commutation of penalty on the ground of extenuating circumstances. The death penalty in Egypt was frequently commuted to penal servitude, either in the granite quarries of Upper Egypt and Nubia, or in the mines of the Sinaitic desert in Arabia. The provision was presumed to be in the interest of mercy; it was generally cruel enough in practice, and no better than a living death. We have mentioned the fact that the sacerdotal and the warrior classes in Egypt owned most of the land, and merely leased it to the agricultural class for tillage. Contracts of lease have been found, in some of which a fixed rent is provided to be paid, in others a fixed share of the produce. There would likewise seem to have been in effect a system of registration of the title to land. Mortgages and pledges were in use, and the rate of interest upon loans was regulated. A peculiar form of pledge was that of the body of one's parent or ancestor, carrying with it the use of the family sepulchre a form of pledge which derived its force from the Egyptian love of ancestry and the peculiar and most extraordinary care taken for the preservation of the bodies of the dead by embalmment, so that they should be ready for the resurrection. The resurrection of the body and the immortality of the soul were in some manner connected in their religious system; and the preservation of the body intact was deemed to be necessary for its resurrection. No more binding pledge, therefore, could have been given than that of the possession of the burial ground.